No gunsmithing required to put a scope on that old Enfield No. 4 or 5. 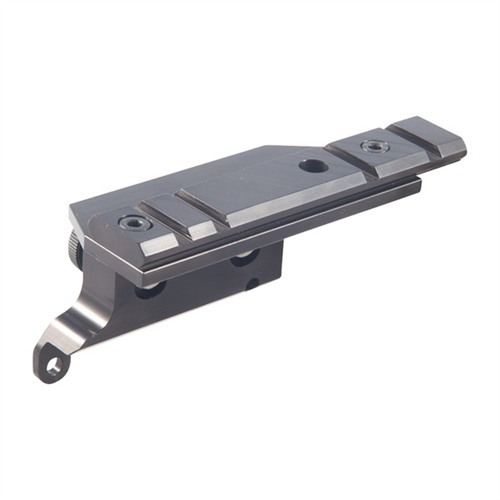 Quick detachable, Weaver-style base is machined to extremely close tolerances for precise return to zero. Attaches solidly to the receiver using the ejector and safety screws. Installation requires no bolt modification or rear sight removal. Leveling adjustments adapt mount to a wide range of receivers; windage adjustments help keep your scope reticle in the center of its range. Does not impair access to safety. SPECS: Aluminum, matte black. 3.9" (10cm) long. Ingen Børsemakerutstyr må sette et omfang på den gamle Enfield nr 4 eller 5. Rask avtakbar, Weaver stil base er lagd for å ekstremt toleranser for presis tilbake til null. Festes solid til mottakeren bruker ejektor og sikkerhet skruene. Installasjonen krever ingen bolt endring eller bak synet fjerning. Utjevning justeringer tilpasse mount til en rekke mottakere; windage justeringer beskytte din omfang reticle midt i sitt område. Ikke svekke tilgang til sikkerhet. 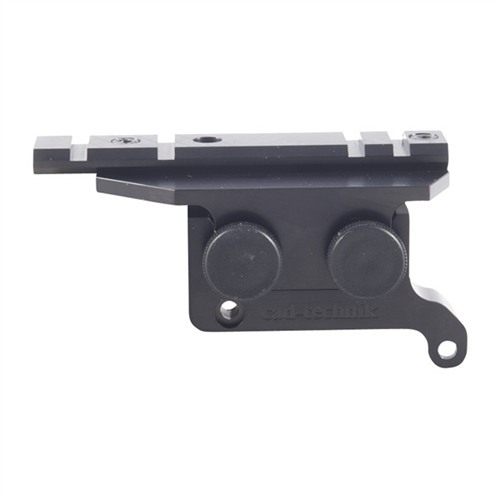 This mount is very easy to install, doesn't require modifying or removing rear sight, and doesn't require original sight mount to be present, which is handy for sporterized rifles. Purchased this Jan2012 - simple to install, took about five minutes. Perfect fit. Fit and finish of product is outstanding. Wish I had seen this several years ago! Due to the stock layout, you will need a comb riser like that on the "T" model sniper rifles. Several folks make them. I'm using a Blackhawk that seems to meet my needs perfectly. This scope mount for the Enfield No4 &5 rifles brings a stable and easy to use mount to these neglected rifles. extremely easy to mount, with no alteration of the rifle. 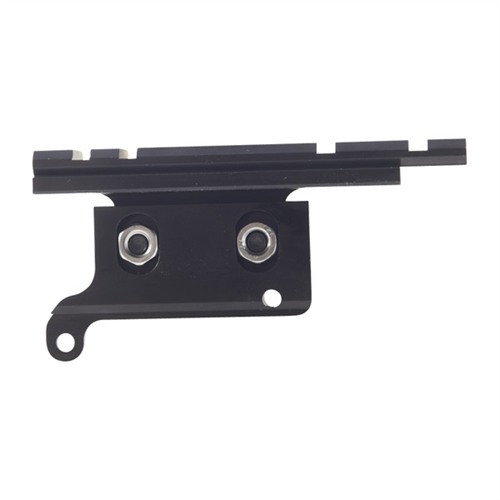 Mount leaves better access to loading the magazine than any previous style of mount. A great duplication of the Enfield No3 T sniper mount, but much lighter and less expensive than copies of the sniper mount. I am extremely pleased and highly recommend this mount if you want to mount a scope on the No4. Solid construction , easy to fit. Holds zero well , even if you have to keep removing scope for transit. I've had mine about 5 years now and I'm still very pleased with it. Good cheaper option than finding original sniper fittings. Must be good ...it's Officer proof !! This attached fine, but the mount platform was skewed higher in front, and I could not adjust a scope low enough to compensate. Worse, when I sent it back and then called to ask them to check to see if it was just milled incorrectly, they expressed no interest in doing anything other than putting it back into stock. That was earlier today. Great mount, super easy to install. Its great cause you dont have to remove the factory rear sight and all you have to do is untwist the two knobs and the scope comes right off giving you access to the rear battle sight and you can load with stripper clips if you still wanted to unlike other mounts. Its machined to very tight tolerances so I have no doubt that removing and replacing the scope will not affect zero(though I have not tried it yet). Also keeps the scope mounted nice and low so its not hanging up in the air. 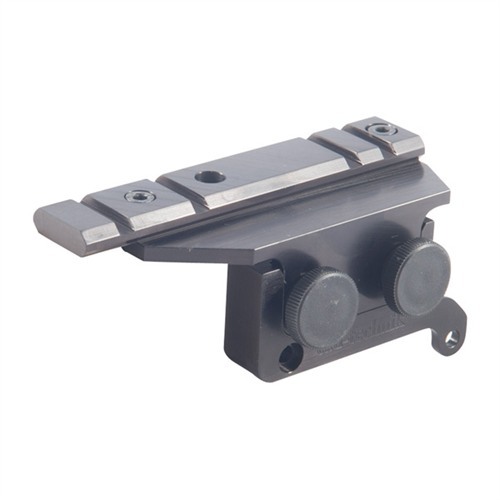 The top rail is also adjustable for scopes with longer eye relief or just have a longer length. Costs more that other types of mounts but I think its more than worth it. The base and mount itself is great. The rail is too big for most rings to get a good solid base. I first tried weaver quad lock rings but the didn't hold firm. So i upgraded to leupold. Same issue. Went back to store with the mount in hand and no rings bit it hard enough. So I had to replace the rail with a weaver rail (which meant drilling and tapping accordingly) and then any rings i wanted would work. Aside from that its a good mount and solid, but if you're not sure of your mechanical abilities to drill and tap a replacement rail, probably not worth the hassle of finding rings that'll stay solid. The scope mounting system is a good quality material. The rail is over sized (too big) for most rings to grab a good solid base lock. I tried weaver rings but they didn't hold firm to the rail, tried leupold rings same issue. Having trouble with lower receiver base mount (screws too long), locked up the Bolt in the receiver, had to trim screws. Also screws at bottom of mount will apply too much pressure to mount, causing mount to tilt away from receiver at top, making scope rail tilt out of level. Upper mount moving when downward pressure on front of scope is applied; Base is machined to extremely close tolerances for precise return to zero. ! !So They Say!! ( Had to use brass shim between lower and upper mount at front side of mount to stop movement). No sense in having a two-piece system if it moves! I have not taken it to the range yet Iâm still trying to re-engineer this system. Use loctite on everything, one-piece is better than two. 2 liters/galons of loctite must be used before shooting ! Bullets and time lost to fix the problems, but now it would be OK ? Produsentnr. : Z0011 Ingen Børsemakerutstyr må sette et omfang på den gamle Enfield nr 4 eller 5. Rask avtakbar, Weaver stil base er lagd for å ekstremt toleranser for presis tilbake til null. Festes solid til mottakeren bruker ejektor og sikkerhet skruene. Installasjonen krever ingen bolt endring eller bak synet fjerning. Utjevning justeringer tilpasse mount til en rekke mottakere; windage justeringer beskytte din omfang reticle midt i sitt område. Ikke svekke tilgang til sikkerhet.